How to solve security issues and problems arising in distributed systems. Security is one of the leading concerns in developing dependable distributed systems of today, since the integration of different components in a distributed manner creates new security problems and issues. Service oriented architectures, the Web, grid computing and virtualization - form the backbone of today's distributed systems. A lens to security issues in distributed systems is best provided via deeper exploration of security concerns and solutions in these technologies. Distributed Systems Security provides a holistic insight into current security issues, processes, and solutions, and maps out future directions in the context of today's distributed systems. This insight is elucidated by modeling of modern day distributed systems using a four-tier logical model -host layer, infrastructure layer, application layer, and service layer (bottom to top). The authors provide an in-depth coverage of security threats and issues across these tiers. Additionally the authors describe the approaches required for efficient security engineering, alongside exploring how existing solutions can be leveraged or enhanced to proactively meet the dynamic needs of security for the next-generation distributed systems. The practical issues thereof are reinforced via practical case studies. Distributed Systems Security: Presents an overview of distributed systems security issues, including threats, trends, standards and solutions. Discusses threats and vulnerabilities in different layers namely the host, infrastructure, application, and service layer to provide a holistic and practical, contemporary view of enterprise architectures. 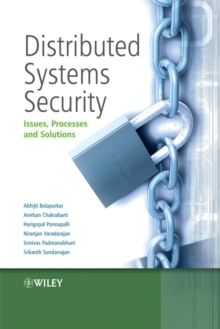 Provides practical insights into developing current-day distributed systems security using realistic case studies. This book will be of invaluable interest to software engineers, developers, network professionals and technical/enterprise architects working in the field of distributed systems security. Managers and CIOs, researchers and advanced students will also find this book insightful.